Kiosks, used to search resources, in the Histreet gallery located in Chuo, Okinawa City. [Okinawa] This past March, the City History Editorial Officers of Okinawa City established “Web Histreet,” the Okinawa City Postwar Data Digital Archive, a website that promotes various resources regarding the city’s postwar history. The site enables people to search for news articles regarding topics they are interested in. People can then view the printed article on one of the kiosks located in “Histreet,” the City Postwar Cultural Gallery located in Chuo, Okinawa City. Currently, the website holds several hundred thousand articles from Ryukyu Shimpo and Okinawa Times, which will continue to grow. The hope is for people to make use of this resource when researching Okinawa’s postwar history and to attract more people to the gallery. 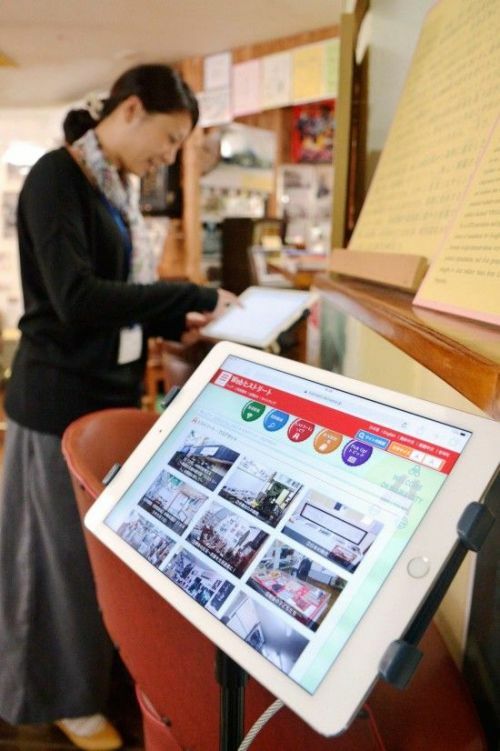 Establishing the website was a part of a 2016 project for the city called, “Postwar Cultural Gallery Project.” The website was funded by a one-time grant and is available in Japanese, English, Korean, and Chinese (traditional and simplified) languages. The website also promotes information on exhibitions currently being held at the gallery, along with resources published by the City History Editorial Officers. The website holds a large amount of old newspaper articles. For example, articles from Ryukyu Shimpo’s predecessor, Uruma Shimpo. It also carries articles from Chubu Information and Chubu Daily, which circulated throughout the central part of the Okinawa Main Island between the mid-1950s to the early 1960s. People are able to search by keyword(s) or from a chronological table. A list of related articles and their headlines will display after clicking the search button. Additionally, there about 100 video clips. The search function can be used anywhere as long as there is Internet access. However, viewing the printed articles and video footage, along with printing can only be done from one of the four kiosks located in the main Histreet building. Additionally, printing requires an application to the city, and depending on the article, some cannot be printed. Project General Manager Genta Maeshiro explained, “A large amount of government documents under the U.S. occupation were destroyed. In order to understand the situation of back then, (we) began collecting newspaper articles.” He then said, “(We) would like people to learn more about the city’s history” and urged people to utilize the website.